The Alabama A&M Bulldogs shrugged off the news that they had been picked to repeat as SWAC East Division football champions in a poll of league coaches, sports information directors and selected media members. The Bulldogs at SWAC Football Media Day at the Cahaba Grand Conference Center said they want more than another division title. They want to win the SWAC Championship Game, something they failed to do last season when they let a 21-17 lead early in the fourth quarter slip away in a 30-24 loss to Prairie View A&M. 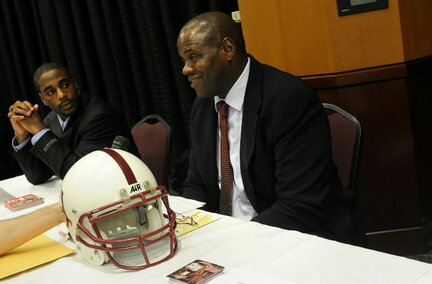 The loss left Alabama A&M with a 1-4 record in the SWAC Championship Game with their only title coming in 2006. "Our expectations are very high," Bulldogs senior offensive lineman Anquez Jackson said Tuesday. "We reached our goal last year, but we didn't finish it. We lost a heartbreaker. Our focus this year is on getting back to the championship game and winning it." The 6-foot-4, 345-pound Jackson from Fairfield believes the Bulldogs just have to work hard and "stick together as team" to accomplish the goal. A&M head coach Anthony Jones is optimistic about his team's chances to claim the title, following their 7-5 finish in 2009. "I always have confidence in our guys," Jones said. "For us to repeat, it's going to take a lot of hard work, coming together quickly as a team and some luck. "We lost a lot of weapons on offense, but we have some good lineman and the only experienced quarterback (sophomore Deaunte Mason) in the division coming back. Any time you have your quarterback coming back it gives you a chance." Here is the preseason poll as voted on by the Southwestern Athletic Conference coaches, sports information directors and select media members, with first-place votes in parentheses and total points. 5. Arkansas Pine Bluff (1) 37Mason took over as the starter in the fourth game of last season and threw for 1,018 yards and six touchdowns. He also ran for six TDs. While A&M was tabbed as favorites in the East, the Alabama State Hornets were picked fourth in the five-team division. State junior defensive lineman Kynjee Cotton of Daphne has a different take. "We're expecting to win the East and go to the SWAC Championship Game," Cotton said. "I believe in this team and the guys we have." Cotton led the Hornets in tackles for losses (12) and sacks (6.5), and finished tied for fourth in tackles with 38. "It all starts on defense," Cotton said. "We lost a lot of key players, but we've got some young, energetic guys who fly to the football." Hornets head coach Reggie Barlow believes his team can contend thanks to six returning starters on offense and five on defense from a team that finished 4-7 overall, 1-6 in the conference in 2009. "I feel good about our chances," Barlow said. "I think we have to be tough on defense and create turnovers. Offensively, I think we'll be explosive. We have guys who can make plays with the ball in their hands." At the top of that list is junior receiver Nick Andrews from Maplesville, a second-team all conference selection last season after leading ASU with 47 receptions for 803 yards and five touchdowns. One of the Hornets main goals in preseason camp will be to settle on a quarterback. "The quarterback spot has been difficult to fill since Tarvaris Jackson left (after the 2005 season)," Barlow said. "We've got Anthony Speight, the old vet, and Rashard Burkette, a redshirt freshman who has all the physical tools." Speight, who played at Jess Lanier (now Bessemer City) and began his college career at UAB, appeared in 11 games last season in a reserve role. He completed 32-of-62 passes for 314 yards and three touchdowns. what does that have to do with requesting a topic?